After a not so strong attendance last week, the NY Masters kicked back into gear with a super strong field this week! Joining us for the first time ever was 2 time World Championship candidate, GM Jan Ehlvest! 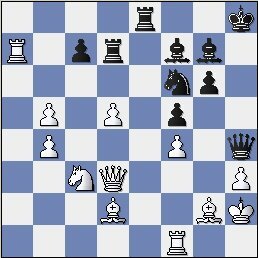 Just a few years ago, Ehlvest made it to the final 16 in the World Championships, knocking off Super GM, Vassily Ivanchuk in the process. We had 5 GMs in total, as Pavel Blatny came directly from JFK airport to the Marshall Chess Club. The UMBC crowd came down also, as GM Wojtkiewicz and IM Charbonneau drove all the way from Maryland! A new important rule has been established in the NY Masters. From now on, INCREMENT is preferred over TIME DELAY. Thus, if either participant wishes, the game can start with 25 minutes and 5 seconds are added to the clock after every move! 2 Margulis – Ehlvest SEE BELOW! As usual, there was some WILD action in the first round! Wojtkiewicz had no prayer of beating Noah Siegel, as he had rook and bishop versus Noah’s rook and 4 pawns! Noah, who is on Spring break from college, must have let his nerves get to him, as he allowed the grandmaster to pick off his pawns one by one and finally to achieve rook and bishop versus rook. Noah tried to claim a draw, but the chances of the rook and bishop are too great, thus his claim was denied and he ended up losing the game. The new increment time setting was a great help for Jenn Shahade. She was down a pawn in a rook and pawn ending against Stripunsky, and also had not much time to boot. On the other hand, her position was very easy to draw as she had a much more active rook and king, and the extra 5 seconds she received after every move made things a lot simpler. 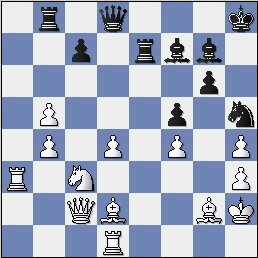 After this exchange, black has the advantage, in large part due to the blockading knight on d5. Ehlvest’s position is picture perfect. 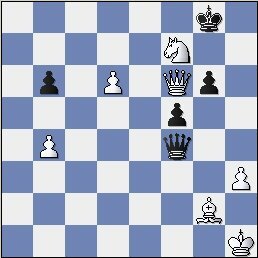 The knight is perfectly placed on d5, blockading white’s isolated pawn. Blacks king is MUCH more active than white’s king, which is still restricted on the first rank. The black rook is extremely active as well. For players like Ehlvest, positions like this are child’s play. 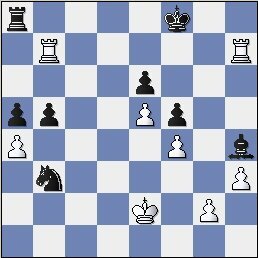 35.Kf2 Ne4+ 36.Ke3 Nxg3 37.Bc2 f5 38.Bb3 Ne4 39.Bf7 Nc3 40.Bg6 Nd5+ 41.Kf3 Ke6 42.Be8 Nb6 43.Bc6 Kd6 44.Bb7 a5 45.Ke2 Nd5 46.Kf3 a4 47.Bc8 b4! The a-pawn will make it to a1, thus Margulis resigned. 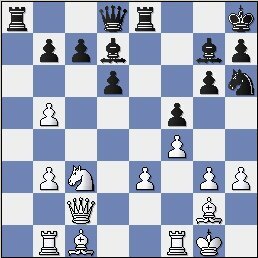 1 G.Shahade (1) – Yudasin (1) SEE BELOW! We have reached the same position as last week. Last week I gained some advantage pretty quickly out of the opening, does Yudasin have some improvements in store? Yudasin was probably not happy to have allowed this maneuver. 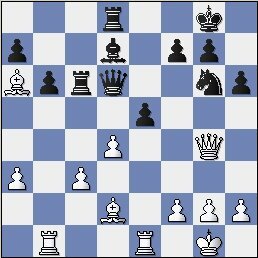 I can play it now, because after black responds with 23….e5, I have 24.Qg3, pinning the e pawn to the undefended queen on d6. When the queen was on c7, I didn’t have this luxury. 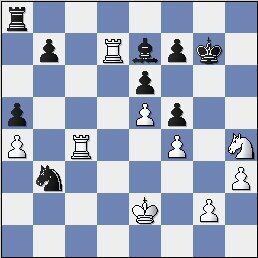 I saw no reason to take a draw by repeating the position just yet, and instead blundered a pawn away. But in general, why even bother playing chess if I am going to agree to a draw with so much play left in a position. 27.Ne5? 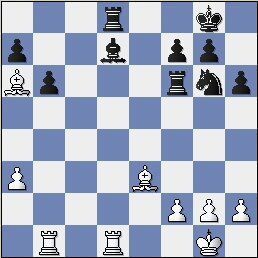 Bxe5 28.Rxe5 Ng6 29.Ree1 e5! Ugh, the rook on c6 defends the queen on d6, meaning that I can no longer pin the pawn with Qg3. 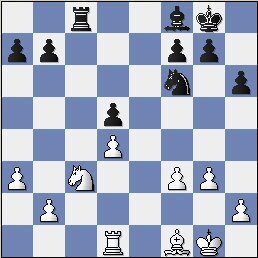 30.Qf3 exd4 31.cxd4 Qxd4 32.Be3 Qf6? This is the reason that 32...Qf6 was inaccurate. Now black has serious issues untangling his pieces. White no longer stands worse, and perhaps stands better in this position. I only had about 2 minutes left on the clock, but things are not so terrible now that I had increment on my side! At this point I gave up any dreams of glory, as my clock was ticking down and I was fearful of black’s counterplay and whether or not I would be able to handle it with such little time remaining. 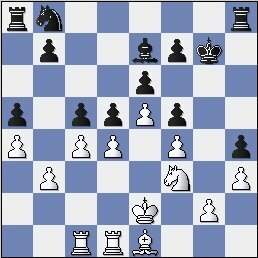 For example, I saw that if I played 47.Bg2, black would play Re1+ 48.Kh2 Ne5, with annoying ideas like Ng4+. Now the game should end in a draw. Yudasin has been trying hard to win, taking advantage of my relatively low clock time, however it is completely hopeless in this position, especially when 5 seconds are added to my time every move. Finally Yudasin said “Ok” and reached out his hand. 2 Yudasin (1.5) – Bonin (2) SEE BELOW! Once again, there was a quick draw agreed on first board. If you ask me, this practice often makes little or no sense for one of the participants. Last week, Yudasin had the white pieces against Stripunsky in round 3 and agreed to a quick draw. This means that Yudasin would have BLACK in the last round, whereas Stripunsky would have white, automatically giving Stripunsky a distinct advantage. As it turned out, Stripunsky won last week and Yudasin ended up losing the last game. 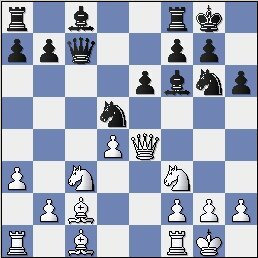 This week a similar situation occurred, as Wojtkiewicz gave away a draw to Ehlvest. 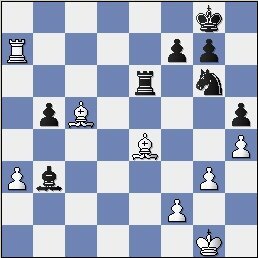 This time it makes even less sense to me, as its almost a certaintly that Wojtkiewicz will have the black pieces against a very strong player in the final round. 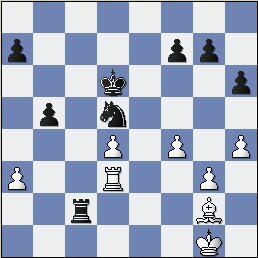 Meanwhile Ehlvest will have white pieces, and being the world class-player that he is, is almost sure to play for the victory. Why give your main competition such a huge advantage without even playing a move? I was paired with Stripunsky, and had a difficult opening but managed to equalize. Things traded down to a bishop endgame in which I had an advantage, and was even winning at one moment, but in the time scramble I blew it bigtime, and allowed Stripunsky to queen a pawn. Stripunsky was now amongst the leaders with 2.5/3. Now Bonin would be the only player with a chance to go 3/3, yet he would have the unenviable task of defeating Yudasin to do so. Meanwhile Yudasin needed a win to join Ehlvest, Wojtkiewicz and Stripunsky at 2.5/3. 17.a4 c5 18.b3 Kf8 19.Be1 Kg7 20.Ke2 Nd7 21.Rac1 Nb8 22.Bxf5 gxf5 23.c4! 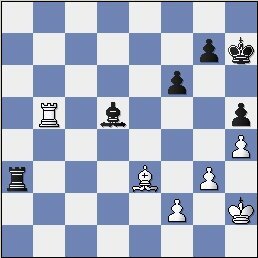 White is much more prepared to open up the position, as most of black’s pieces are still resting on their initial squares. It’s tough to play against a GM with none of your pieces developed! 23...dxc4 24.Rxc4 Nd7 25.dxc5 Nxc5 26.Bxh4! A nice shot, winning a pawn. Black’s position is in dire straits. Winning. 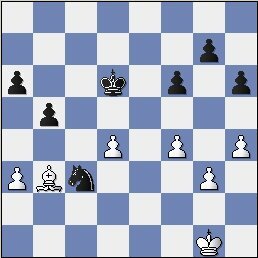 If black plays 28...Bxh4 29.Rxb7 Na1 30. Rb1 and the knight is trapped on a1. 1 Ehlvest (2.5) – Stripunsky (2.5) SEE BELOW! 4 GM’s were slugging it out for first place in the final round. Yudasin and Wojtkiewicz made things more tense when their game ended in a draw. Yudasin had a chance to simply win a piece for nothing, but shockingly missed it. Although he still had the edge, Wojo was able to recover from this near certain loss, and salvage a half point. Blatny, Charbonneau and Privman also won their last round games, thus leaving, Yudasin, Wojtkiewicz, Blatny, Charbonneau and Privman with three points. It would all come down to the last round game. Either Ehlvest or Stripunsky would take clear first, or there would be a massive 7 way tie for first place! 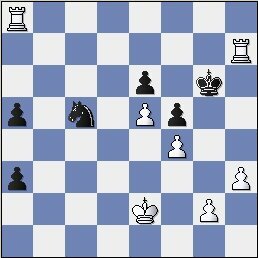 Stripunsky decides to jettison the b7 pawn to complete his development. 20.Bxb7 Rb8 21.Bg2 Ng8 22.b4 Nf6 23.Bd2 d5 24.Rfc1 Re7 25.Rb3 Be8 26.Kh2 h5 27.Rd1 Bf7 28.Ra3 h4!? 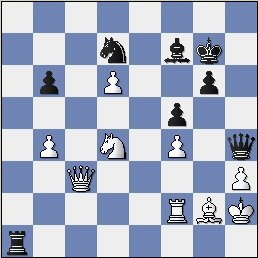 Stripunsky, not willing to dawdle about any longer, sacrifices two pawns to go for Ehlvest’s king! 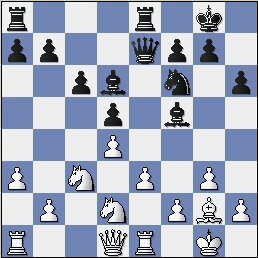 Ehlvest is up 3 pawns on the board, but what ugly pawns they are! Now it’s heating up! One is always scared when the queen is so close to one’s king, especially when the king lacks real pawn protection! 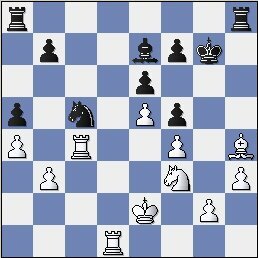 The good news for white, is that it’s very difficult for black to bring the rest of his pieces over to the kingside. 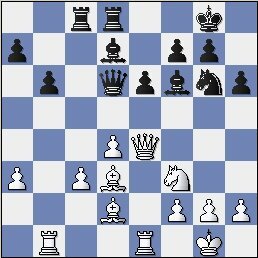 Ehlvest ignores Stripunsky’s attacking pieces, and simply proceeds with events on the queenside. 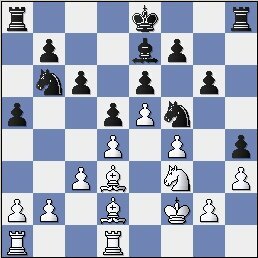 35...cxb6 36.Rxd7 Nxd7 37.Nb5 Ra8 38.Bc3! At this point both players had just 2 minutes left, with the 5 second increment. 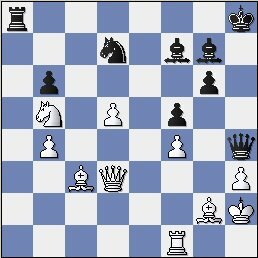 White is threatening Qxa1 and Ne6+ followed by Qg7 mate! Things look dire, but black found the only saving grace in moving the king. Ehlvest’s knight is heading to g5. White is the one attacking all of the sudden. One could say black’s attack was always doomed to fail, as it was only backed up by the lone queen. Ehlvest captured this knight very quickly, confident that there was no perpetual check. 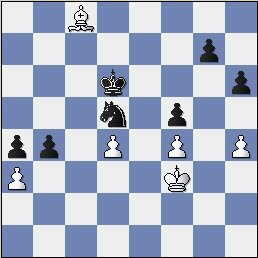 Looks like Ehlvest was right, as black will run out of useful checks in one move! And GM Jan Ehlvest takes clear first and $350 in his first ever New York Masters! Word on the street is that he will be back next week too, so we should have some great action coming! Tying for 2nd place and picking up $55 with 3/4 were GM Yudasin, GM Wojtkiewicz, GM Blatny and IM Charbonneau. Also with 3/4 was Boris Privman, which gave him the U2400 prize of $90.